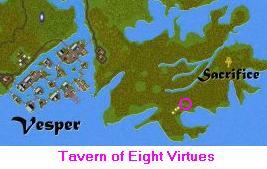 The Virtue Village is located East of Vesper, and South of the Shrine of Sacrifice. It includes the Tavern of 8 Virtues, and has a loose alliance with the Jolly Roger Tavern, and the United Pirates of Britania. It is frequented by many European players, so the hours tend to be early to mid evening european time (which is late moring, to mid afternoon for US players). There are many interesting folk in the village, and some serious role players. They obviously tend to be virtuous, and willing to help out any who come in need. They have a public forge, and many good craftsmen to fill your shopping needs.